The limpets we sell are the herbivorous Black Ribbed Limpets, (Lottia leucopleura). They eat algae and diatoms - they are 100% reef safe. 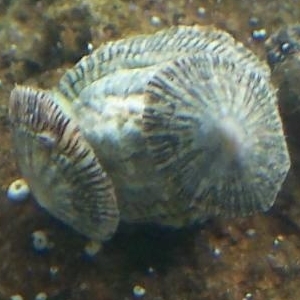 Limpets are gastropods, similar to snails, except they have a round shell that caps the top of their body, they cling closely to rock to cover their bottom half, (as compared to the more evolved snail that can retract into its shell). They are persistent grazers, and will stay in one location until their job is done. The limpets we sell are about the size of a dime, and will grow slightly larger during their lifetime. They will spend nearly all of their time on rocks and glass. Because of their shell shape, they can withstand direct impact from your powerhead or wavemaker, allowing them to clean where other snails, (and crabs especially), dare not travel. However, limpets are unable to right themselves if they are turned upside down unless there is a strong current for them to utilize.When adding limpets to your tank, place them on the rocks so they can establish a grip. During this time, before they can "seal" themselves down, they may be vulnerable to predation. Once sealed down, you will struggle to be able to remove them, they are that strong. The strongest animal on the earth for its size. Yes,and if you ever wrestle one off a surface you will say to yourself "super cool, now how do I get him to move...". We try to ship them attached to a shell from the beach, sometimes they wander off in transit. If they are on the shell, place the shell on the rock and allow them to travel off of it on their own. If the lip of the shell can be flush with the rock when placed in the tank, that is ideal.